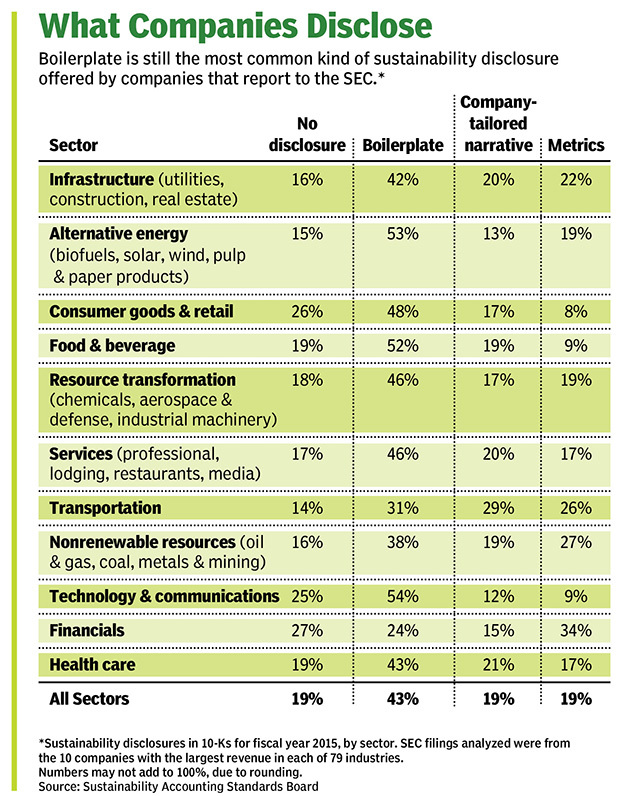 As more investors link sustainability with alpha, they press issuers for meaningful environmental and social disclosures. But here again, the REIT, which owns 96 mainly luxury and “upper-upscale” U.S. hotels containing about 53,500 rooms, is an anomaly. While Chang’s sustainability group worked on the disclosure, it was the company’s finance team members who “were the main drivers … to get this information into a 10-K” for the first time, he says. With Host’s CFO Gregory Larson getting buy-in from the rest of senior management, the effort to fit the water and energy data into a financial reporting context was led by Brian McNamara, the company’s controller. McNamara’s team led the move “because they control the 10-K and everything that goes in it,” Chang said. At many other companies, however, senior finance executives have long interpreted their responsibility for control of financial report contents as meaning that they should report as little sustainability information as possible. Until recently, large institutional investors, pension funds, and money managers showed a parallel lack of interest, reasoning that the link between ESG factors and future cash-flows was vague at best. 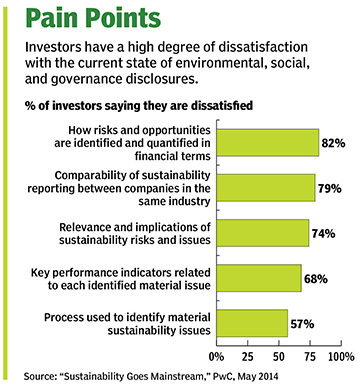 But now it appears investors have grown more hungry for sustainability metrics. In their view, the gender breakdowns of boards, the possibility of droughts, or the likelihood of regulatory crackdowns have suddenly become the stuff of material disclosures. And, perhaps more significantly for investors, they may be the secret to outsized rates of return. 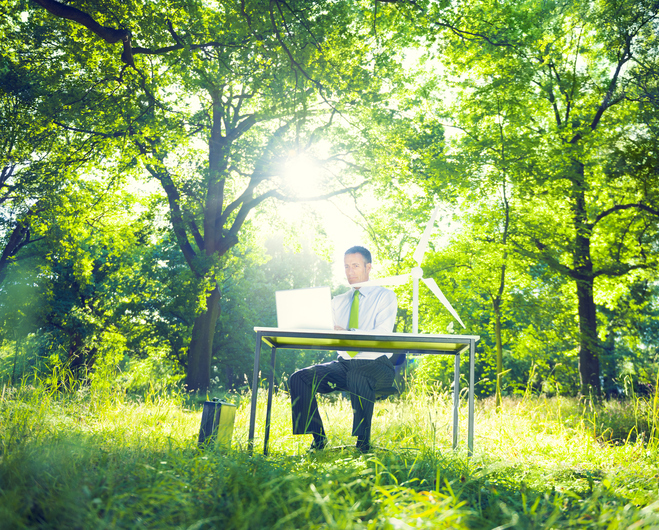 Investor demand for sustainability data has been surging. In its 2016 report on sustainable investing, US SIF, the association formerly known as the Social Investment Forum, reported that investors consider ESG factors across $8.72 trillion of professionally managed assets — a 33% rise since 2014. “Companies need to understand that they need to satisfy the demand. But there’s a disconnect between what investors are [demanding] and what companies are reporting,” says former SEC chair and current SASB director Mary Schapiro. There are, however, powerful advocates for the incorporation of sustainability and other nonfinancial factors into fundamental financial analysis and valuation. “With intangible assets accounting for more than 80% of the market value of S&P 500 companies, and stocks trading at multiples of book value, analysts require better information on ‘nonfinancial factors’ to understand what the market is paying for,” UBS Asset Management contends in a case study that appeared in ESG Integration Insight, a SASB publication, in 2015. The asset manager offers examples of nonfinancial ESG factors “that have changed the value-creation prospects of public companies, but for which fundamental equity analysis does not readily account.” The examples include droughts like the one in Kerala, India, that marred the reputations of U.S. beverage makers, and labor practice risks like the 2013 collapse of the Rana Plaza clothing factory in Bangladesh. “Increasingly, many asset managers and a growing number of investors view ESG factors as complementary to fundamental analysis. Examining corporate performance on material ESG factors ties into financial theory to complete the picture on valuation,” according to the UBS case study. The investment bank lists employee and board diversity, resource conservation, and low employee turnover as indicators of superior company financial performance. Companies employing more women, for instance, “have seen average annual alpha of 3.3%,” according to the report. Using less energy and water per unit of space generated 2.6% (energy) and 1.8% (water) in alpha annually. And companies with low employee turnover spurred 0.8% annual alpha on a three-year test and 3.0% in a 5-year test. After the pension’s representatives present what they consider to be a good case based on the value to the company of adopting a given ESG measure, company executives might protest, contending that they don’t think it’s “in the best interest of the broad shareholder base [or that] the broader shareholder base doesn’t care,” he says. “So we say, ‘We want to file a proposal about the issue. Let’s take it to the shareholders for a vote and see what they say,’” Rice adds. For his part, Aflac CFO Frederick Crawford pleaded for the exclusion of his industry from any such rules. The hospital-care insurer’s management doesn’t believe that “companies such as those in the insurance industry should be required to disclose immaterial public policy and sustainability matters,” he wrote. Crawford also made the case that standard MD&A risk disclosures, instead of more-detailed revelations, would be enough. 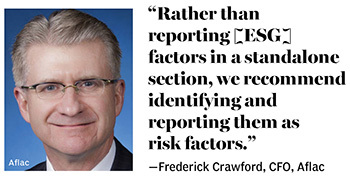 “Rather than reporting [ESG] factors in a standalone section, we recommend identifying and reporting them as risk factors,” he added. But finance teams could still choose to report only sustainability information that they deem material to their company’s fortunes. That would certainly be the case if SASB’s standards come into widespread use. “SASB standards address the sustainability topics that are reasonably likely to be material and to have material impacts on the financial condition or operating performance of companies in an industry,” according to the nonprofit organization’s website. The standards “are designed to be integrated into the MD&A and other relevant sections of mandatory SEC filings such as the Form 10-K and 20-F [the annual report for foreign private issuers],” the board says. Further, SASB often avows that, unlike the Financial Accounting Standards Board, its strictures are voluntary and market-based—leaving senior finance executives very much in the driver’s seat about what ESG factors are essential for investors to know about. “We live in a very, very fragmented world of sustainability disclosure,” says Sara Neff, senior vice president for sustainability at Kilroy Realty, a REIT. As tough as it can be for corporate executives, it can also be difficult for investors to find the right scorecard to use in assessing sustainability. “In the investor community, everyone is really hungry for [a] standard disclosure so that they don’t have to wade through a bunch of noise,” Neff adds. Some experts claim the SEC could be doing more in this area. The requirements for material disclosure in financial statements, including rules mandating reporting of material information regarding climate change, “already exist, and through the comment process, the SEC could be encouraging more complete disclosure,” says SASB’s Schapiro. The current commissioners could focus on climate change by moving forcefully to comment on the adequacy of environmental disclosures in 10-Ks “without the SEC having to write any new requirements, interpretations, or guidances,” Schapiro adds. In the run-up to closing the 10-K, the problem was that Kilroy’s full calendar-year environmental data had yet to be verified and wouldn’t be available until March 30, 2017. The company’s finance and sustainability teams agonized over which data set to employ. “Do you use 10 months of correct data and then start estimating?” Neff says. The other alternative was to use the less timely, but fully verified, 2015 data to complete the reporting of a three-year trend. Kilroy took the latter route, deciding to disclose “tightly, rigorously reported data rather than risk some estimating,” Neff explains. But the decision was a difficult one because the company felt it had timely data to support a sustainability story that it was eager to tell to its largely youthful and environmentally committed tenants. Neff feels that the potential difficulties in getting ESG data in time for the closing of the annual report might put off some CFOs. “The timing of this stuff is really tricky,” she notes. On the other hand, CFOs in industries with a less positive ESG narrative might be fearful of reporting too much of it to investors. “If you are in an industry that is an extreme polluter, there may be some questions about how you present the data,” says Host Hotels’ Michael Chang. David M. Katz is a deputy editor of CFO. One reason finance chiefs may be uncertain about incorporating sustainability metrics in their companies’ 10-Ks is that there are so many environmental, social, and governance reporting standard setters. Here are five of the most prominent.